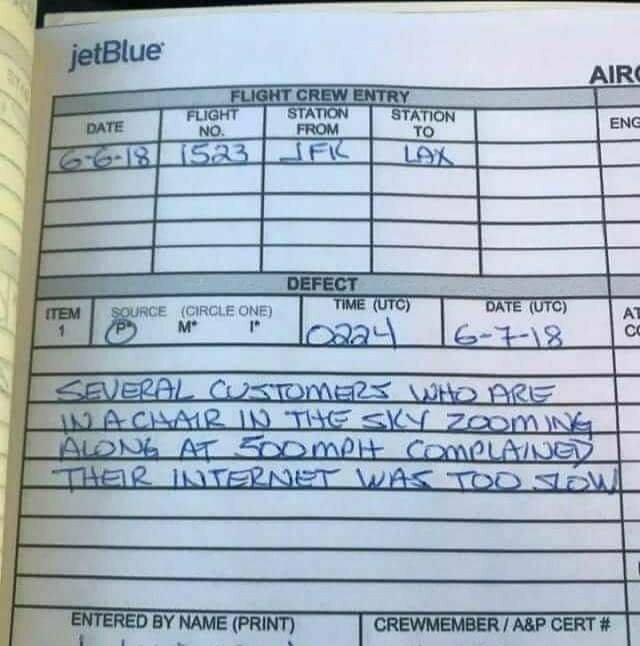 As for the complaint, well Jetblue do advertise that With Fly-Fi®, the things you do daily on your computer, tablet or smartphone can be done in the air – and with impressive speed! Maybe it would be better for the airline to set realistic expectations, rather than imply customers are wrong when pointing out that the advertised service description is not delivered? After all, it is a free service, so why big it up? Having once done JFK to SFO on a Jetblue A320 in a standard Y seat (6 hours 45 minutes) I felt like complaining about EVERYTHING by the time we got there, never again (this being before they had a transcon seat). It is being rolled out slowlyyyyy. A young lady on my last flight told me she couldn’t get logged onto wifi. I apologised and said the aircraft didn’t have it and it was gradually being installed on aircraft. She looked incredulous and said it was ridiculous they didn’t put it in when the planes were built. I couldn’t help but smile when I said, I don’t think that internet was invented when this plan was built. LOL. Our friends across the pond have an absolute fixation with wifi. It’s incredible. Any route other than London to the US you might get one or two enquiries if WIFI is available and if you reply ‘no’ it’s no big deal. On american routes it’s probably the most common question on boarding. And the reaction of some customers when we advise them it’s not available is really quite something. I know it’s almost a given that US carriers aircraft will be wifi enabled but surely you’d do your homework and find out if an airline offer fleet wide wifi if it is THAT important? 747-400 CIVR, CIVS, CIVV, CIVW, CIVY, CIVY, BYGC, BYGD. 777-300 STBB, STBD, STBE, STBL. 777-200 VIIC, VIIG, VIIH, VIIS, VIIY, YMMD, YMME. I couldn’t help but smile when I said, I don’t think that internet was invented when this plan was built. Last month I spent 18 days on a ship. Not only was the WiFi very slow and unreliable, it was also very expensive, at about US$0.35/minute. I make that point because it was charged per minute, not by data consumed. I am on a short sea crossing now, but the wifi is free. She looked incredulous and said it was ridiculous they didn’t put it in when the planes were built. I couldn’t help but smile when I said, I don’t think that internet was invented when this plan was built. Things have moved on a bit since then. FDOS_UK, the topic was “First World Problems”, of which this was a particular instance. It was not specifically about Wifi, but rather an invitation to rferguson/handbag to regale us with similar tales from their own experiences – which they have very kindly done. Well you must be reading a different thread to me, because you posted a Jetblue log recording a wifi complaint, which RF and handbag, with good grace as ever, have responded to by discussing wifi related matters. Last month I spent 18 days on a ship. Not only was the WiFi very slow and unreliable, it was also very expensive, at about US$0.35/minute. I make that point because it was charged per minute, not by data consumed. Just like Compuserve and AOL when they were dial up services. I said, I don’t think that internet was invented when this plane was built. Out of curiosity, why is wifi (or at least the wiring/equipment) not built in the newer aircraft as standard? Surely a retrofit is more complicated, time-consuming and costly..
FWIW, I had a conversation with an engineer onboard a large airline whose fleet have wifi and he said that Boeing don’t offer it as an option, so it has to be installed post delivery, sometimes leading to a delay if the fitting company are busy. Thanks for the Internet history notes, FDOS_UK, that’s interesting. I also remember my first email efforts, I think it was 1996, it was complicated and cumbersome. The Internet was of course a very different place 22 years ago. Just out of interest, is it okay to post an image of an internal airline document on a public forum, like this one?